Christopher Okigbo’s generally acknowledged charm, intrepid exploits in sports, breathless adventures, penchant for imaginative self-portraits, gallantry as well as his enchanting, if often misunderstood, poetry rendered him larger than life in the imagination of his contemporaries and cut him out as a virtual figure of myth. Countless colourful anecdotes about Okigbo’s life and his lionization in a folk war song upon his heroic death in battle during the Nigeria-Biafra war played a role in the creation and sustenance of that mythic image. 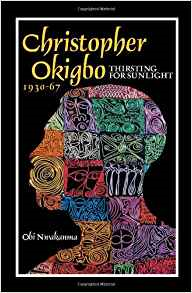 Obi Nwakanma’s biography of Okigbo, Christopher Okigbo 1930-67: Thirsting for Sunlight begins the process of understanding and demystifying the poet. Thus, Nwakanma identifies the primary aim of the biography as “placing Okigbo in time” (x), no doubt by providing a compelling account of the ascertainable facts of Okigbo’s life and death and subjecting them to sober reflection, as opposed to the ethereal light of myth. However, by casting himself in the obvious image of a worshipful acolyte at the enchanted feet of the great poet with the declared intriguing purpose not only of locating Okigbo in time and place but “of clothing him with spirit” (xi), Nwakanma can perhaps only ultimately reify the canonical myths of Okigbo’s life and reinforce our image of an inscrutable poet. Thirsting for Sunlight is a powerful portrait of the poet as a rebel. Rigorously researched, breathless in its revelations, stylistically absorbing and often humorous, the biography is driven by the crucial insight that particular “influences . . . conspired to shape [Okigbo’s] life and poetry” (x). In eight chapters, Nwakanma zealously scrutinizes both Okigbo’s cultural and Catholic family backgrounds, circumstances of his birth, his Igbo culture, education, his astonishing reading in the world’s literature, and Nigeria’s volatile political landscape for clues of formative literary influences. Notably, Nwakanma’s focus is the totality of contexts and movements, cultural, intellectual, political, indigenous, and international that nurtured Okigbo’s consciousness and art. On occasion, though, the handling of international politics seems rather artful. Following a chronology of events in Okigbo’s life, thirteen photographs in black and white, two maps and the Okigbo family tree, the first chapter of Nwakanma’s book focuses on the first fifteen years of his growing up in his hometown of Ojoto. The careful and detailed mapping of the geographical terrain of Ojoto pales in significance only beside the even ampler examination of Igbo worldview, especially the worship of the river goddess Idoto, which Okigbo’s poetry so powerfully brought to world consciousness. Okigbo’s famed priesthood to Idoto is fully set in the context of the Igbo belief system of reincarnation and presented as instructive for the poet’s self-portrait as a prodigal. But Nwakanma is keen to foreground Okigbo’s “double consciousness,” and highlights the equally deep impact of Catholicism on Okigbo’s early life as the son of a father who was a pioneering Catholic schoolteacher. Nwakanma clearly considers the death of Okigbo’s mother Anna when he was five years old the single most important experience of his early life capable of explaining his entire complex personality from his remorseless womanising to his daredevilry; a mindset Nwakanma hints at as a search for that lost ‘mother’. Okigbo’s Western education at the elite Government College Umuahia and thereafter at the University College Ibadan, where he studied Classics, constitutes the main focus of the second and third chapters respectively of the biography. Nwakanma’s attention is still keenly focused on Okigbo’s cosmopolitan background and the hybridity at the core of his writing. He is equally fascinated by Okigbo’s leisurely attitude towards his school work which was in sharp contrast to his outstanding intellectual gifts and wide reading. Nwakanma highlights the deep impact of some of the extraordinary individuals such as William Simpson, Saburi Biobaku, Charles W. Low and Ben Obumselu that Okigbo met at Umuahia and Ibadan on his intellectual and artistic growth. Okigbo’s political discipleship to Dr Chike Obi, a mathematician at the University College, Ibadan, gave him a first-hand knowledge of the distinctive terrain of Nigerian politics and no doubt prepared him for the central roles he played later in national events. In this book, the crucial subtext of the biography is the temper and potentials of Okigbo’s generation and their contribution in shaping the nature of Okigbo’s poetic fervour. By constantly linking Okigbo’s career with those of his contemporaries and providing regular and extensive catalogues (occasionally repeated) of Okigbo’s peers and their profiles, Nwakanma aims not merely to set in relief the catholicity of Okigbo’s friendships but even more importantly to foreground his thirst for the limelight by imagining the poet as a nexus of connecting lines of intellectual influences. Thirsting for Sunlight is a multi-layered narrative of the poet’s generation and times, with the poet at the centre. Nwakanma’s characterisation of Okigbo as a deviant is at the core of the biography. His habitual tantrums as a child and deviations from family norms, as well as his disregard for authority, demonstrate for Nwakanma the enigmatic temperament of a genius. Typically indulged and granted generous concessions, Okigbo trudged through school with modest grades and had to re-write his degree examination at the University of Ibadan before he passed it. Nwakanma painstakingly shows how Okigbo’s contempt for the conventional and orthodox and his bohemian attitude to life meant that his careers in the civil service and in business ended disastrously. Okigbo resigned his appointment as Regional Sales Manager at Nigeria Tobacco; left his position as Trainee Manager at the United African Company; was sacked from his post as Administrative Officer in the Federal Ministry of Information and Research because he ran a private company while still in the civil service. At any rate, his business enterprise was soon to go bankrupt too because he lacked both the competence and commitment required to succeed in a business venture. Leisurely and self-indulgent, Okigbo clearly envisaged work as the primordial curse. The rest of the book highlights the paradox of Okigbo’s discovery of poetry through adversity, the growth of his art, and both the multicultural character of his work as well as his increasing involvement in national and African political experience. Offered a job as a Latin teacher and Vice Principal of Fiditi Grammar School by his friend and principal of the school, Alex Ajayi, Okigbo gradually recovered a zest for life and the therapeutic value of poetry after the trauma of the loss of his job in the civil service. Nwakanma emphasises Okigbo’s discovery of the Muse of poetry in Fiditi and notes the influence of Virgil and T.S. Eliot, and a reflection of his childhood experiences on Okigbo’s earliest poetry. Leaving Fiditi in 1960 for the new University of Nigeria, Nsukka, where he worked as acting University Librarian, Okigbo was unusually absorbed by the challenges of his new position (even while his womanising became even more adventurous). Greater access to international poetry and the intellectual vibrancy of the university environment had a beneficent effect on his art. Nwakanma especially emphasizes the influence of the Welsh poet Peter Thomas on Okigbo’s poetry at this period. Similarly, on Okigbo’s return to Ibadan in January 1962 as the West African Regional Manager for Cambridge University Press, the intellectual stimulation provided by the university of Ibadan and the intense cultural and political developments in the city led to the maturation of Okigbo’s art. The Mbari Club played a pivotal role in the cultural life of the city and Okigbo soon became its secretary as well as the editor of Mbari publications. 1962 saw the publication of his seminal collections, Heavensgate and Limits. Nwakanma examines in considerable details the national political crises leading to the military coup and the counter coup of 1966, and remarks Okigbo’s involvement with these issues through his association with the key figures, such as Major Emmanuel Ifeajuna, one of the leaders of the first coup d’etat in 1966. The biographer documents the gory details of the pogrom against Igbo people resident in northern Nigeria, the onset of the civil war, Okigbo’s audacious undertaking to procure arms for Biafra, and his enlistment in the Biafran Army. Nwakanma’s speculations on why Okigbo enlisted into the army are legion and insightful and his documentations of Okigbo’s gallantry as a guerrilla soldier, fighting without training and in defiance of personal safety and conventional rules of warfare, are impassioned. The portrait of Okigbo as a soldier is a culmination of the colourful legend of the hero, hitherto believed and publicised in the historization of the war. The headstrong child who risked death in jumping from a tall tree for the adulation of his peers; the outlaw with a penchant for raiding the school orchard even when he was not particular about oranges; the stuntsman toying with electrocution in the name of a sentimental attachment to an ancient ghost radio: all these anticipate the daring Biafran guerrilla soldier killed in a lonely confrontation with an armoured tank. Thirsting for Sunlight is a boon to the reader of Okigbo’s poetry even when Nwakanma claims he “does not aim to raise critical or philosophical questions about the value of the literary text” (x). The crucial contexts of many of the poems are exemplarily highlighted. For example, Nwakanma’s inscription of Okigbo’s anguished recollection of his mother’s funeral as the background to the solemn sequence, “The Passage” in Heavensgate, enriches our understanding of the poem by foregrounding its autobiographical source; he thus clarifies the intensity of the poem’s sobriety through his evocation of the gripping image of the poet as he “grapples with the terrifying scene as it unfolds in a child’s vision” (11). Crucially also, by Nwakanma’s acceptance of the challenge of reading up the enormous intellectual background that nurtured Okigbo’s art, he is typically able to guide Okigbo’s readers. Many intriguing phrases and allusions are contextualised. “The stone surface” of Siren Limits, for example, is traced to the architecture of Cambridge House, Ibadan. Besides, some of the enchanted figures of romantic legend in Okigbo’s poetry are given a local habitation and historical names. Kepkanly is clothed in human flesh. The nature of Okigbo’s mystical relationship to Idoto is examined in details, with Okigbo revealed as the reincarnation of his maternal uncle who had been the priest of the deity, a duty the poet inherited; Okigbo’s aunt Eunice is identified as a source of his passion for music, and an element of his satiric wit is traced to the historically ascertainable character, Jandum. Nwakanma places Upandru in this category, identifying him as “Up Andrew,” a “travelling minstrel,” “a gifted, handicapped performer from Achina” whom he likens to Tiresias, the blind prophet, and considers a model of the prophetic element in Okigbo’s poetry (26). However, unusually, Nwakanma cites no reference to authenticate this kind of claim.1 Occasionally also the reader is offered a poem’s background as its meaning. Moreover, one feels that such statements as “Hart Crane[’s] . . . influence is also obvious in Okigbo’s poetry” (203); “Okigbo’s admiration for this poet [Tchicaya U Tam’si] is reflected in the echoes of U Tam’si’s Bushfire [Feu de brousse] in Okigbo’s Path of Thunder written at that period” (222) and many other such claims would have been more insightful with even the slightest substantiation. And when Nwakanma pronounces Peter Thomas’s poetry the irrefragable source of the title of Okigbo’s sequence, Heavensgate (158), he ignores Okigbo’s considerable critical heritage, and especially the exemplary labours of some of Okigbo’s most distinguished scholars such as Obumselu and Dan Izevbaye on the subject in their own published works. Thirsting for Sunlight is a poorly proofread work. Repetitive, digressive, littered with grammatical blunders and misprints, it is also rather indulgent in its attitude to its subject. It should be noted that Nwakanma’s exaltation of Okigbo’s gallantry does not completely erase his hero’s thousand other faces. After all, Nwakanma’s relentless documentation of Okigbo’s womanising is a fixation perhaps only comparable to Okigbo’s own obsession with sexuality. Pleading the deep impact of Okigbo’s early loss of his mother and making the Beat poets the flagrant offenders for teaching Okigbo their radical moral vision, Nwakanma recurrently invokes Freud to no avail to absolve Okigbo of the stain of what this biographer calls his “immoderate infidelities” (117). For sure, some of the many women that Okigbo toyed with, even when they were sincerely devoted to him, are unlikely to be among the entranced devotees at Nwakanma’s Okigbo shrine. Many of Nwakanma’s interviewees for this book strain to indulge Okigbo even in complete disregard of evidence pointing otherwise: Nwakanma’s biography of Okigbo perpetuates his myth. The reader is asked to accept Okigbo’s irresponsible extravagance as “disdain for money” (185); his aversion for enduring relationships with women is presented as an “affirmation of the transcendence of the imagination” (190); and we are asked to see his casual indiscriminate liaisons as “democratic, determined by neither class nor status” (190) and, moreover, as “emblematic of his courage” (161). Even with his wife Safinat Atta, the Igbira princess he wooed for long because her family had deep reservations about Okigbo’s lifestyle, and their daughter, Obiageli, Okigbo preferred a long-distance arrangement because, according to his biographer, Okigbo “felt distracted by continuous feminine presence in his space and could not perform his artistic and creative functions” (190). Appraising the controversial topic of “plagiarism” in Okigbo’s poetry, Nwkanma praises Okigbo highly for “stealing with genius and originality”! (135). On occasion, the biographer indeed seems taken in by his own myth-making. When Nwakanma reports with no sense of irony that Okigbo “wrote the best essay on Greek tragedy ever submitted by any student in the Classics department of his time at Ibadan” (95), did he perhaps forget that he actually used a euphemism when he noted earlier that Okigbo and his friend Obumselu “collaborated” (82) on the said essay? Nwakanma could count only two biographies of African writers—Armand Guibert’s of Leopold Senghor and Ezenwa Ohaeto’s of Chinua Achebe—when he was at work on Okigbo’s biography, and when the cloth edition was published in 2010. Since then, several biographies of Nigerian writers have been published. Among these include Ezechi Onyerionwu’s Ahmed Parker Yerima: The Portrait of an Artist as a Dramatist (2017) as well as his Akachi Adimora-Ezeigbo: Life and Times (2017), and Sule Egya’s Niyi Osundare: A Literary Biography (2017), to mention a few. However, even in this august company, Thirsting for Sunlight remains preeminent. It is hoped that the recent paperback edition will place this invaluable work in the hands of the many readers thirsting for knowledge of Christopher Okigbo, gifted poet and fascinating man of action. 1. Notably, in his introduction to his A Concordance to the Poems of Christopher Okigbo, MJC Echeruo considers “Upandru” a pun on Ezra Pound and notes that in describing him as the “village explainer,” Okigbo adopted precisely Gertrude Stein’s phrase for describing Pound.